Fortunata is the daughter of a shoemaker. A shoemaker whose shoes are mis-matched, bright and ugly colors, and can't be sold. Ever since her mother passed away, and the 'fairies' have stopped cleaning her father's shoemaking tools, Fortunata's father has gone from the best shoemaker in their village, to the worst. Fortunata doesn't believe in fairies. So when they leave the village, and run into a fortune teller, she knows the fortune teller is a fake. 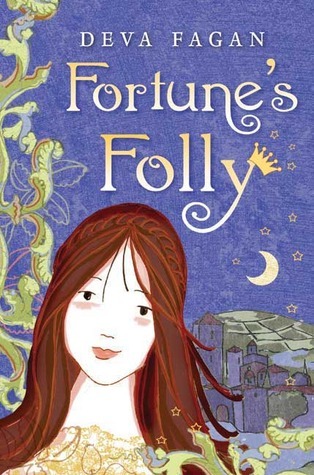 And when the fortune teller asks Fortunata to be her assistant, she agrees. Taken to the castle, she is forced to tell a fortune for the prince. She tells of a quest for a sword, and saving a princess to be his bride. The catch? 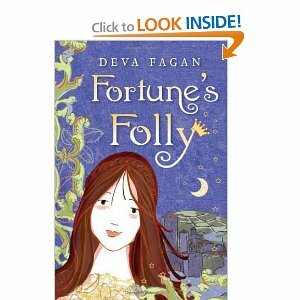 If her fortune doesn't come true, her father will be killed. So she goes with the prince, to ensure the success of the quest. Unfortunantly, the only way for the quest to come true is for the prince to marry the princess. And Fortunata has fallen in love with the prince. I loved this book because there were so many surprises. You would think you had everything figured out, and BOOM! Another surprise! It had a bit of the tale 'The Elves an the Shoemaker' worked into it. The book was wonderfully written, and had a fantasy element. However, every bit of fantasy had a reasonable explanation. I love fantasy, but this story had a fresh look on it all. I would recommend it whether you are a lover of fantasy, or not. Though sold under Young Adult, it is very clean. I really loved this book, and could not put it down until I reached the end! This sounds TERRIFIC, Shelby! I love fairy tale retellings, and even if this isn't an exact retelling, I know I'll like it. Yay! Thanks! I spread the word on my blog, hopefully people will come and read it! This looks great! I love stories that play with fairy tales.